Fast thinking by an SCG team saved the day for the launch of JCSAT 2, which was in jeopardy of being scrubbed when a telemetry transmitter malfunctioned at the launch site. The team’s unique plan to lower a technician into the satellite to retrieve the malfunctioning unit resulted in the successful December 31 launch of the Japan Communications Satellite Company’s (JCSAT) JCSAT 2 spacecraft from Cape Canaveral. Mechanical technician Pete Corbett, rigged to a special safety harness, is lowered into an HS-393 spin stabilized satellite in a never-before-used procedure to remove a malfunctioning telemetry transmitter from JCSAT-2. Assisting in the high bay area were (on top from left) SCG Fire Department officials Dean Anders and Jeff Alvich, with help from JCSAT-2 System Engineering Manager Art Rosales. With only 7 days to remove, fix and replace the transmitter, a task team was assembled to carry out a plan to lower a man into the satellite to remove the unit. “Since the procedure had never been done before, we had to demonstrate it, videotape it, and give a presentation to the Air Force Safety Officer to prove it was feasible and safe,” Rosales said. The plan involved rigging a special safety harness above the spacecraft and lowering mechanical technician Pete Corbett down to the transmitter. In addition to bypassing the reflector and unsealing the thermal blankets, the technician had to squeeze down the side of the spacecraft through a clearing of only 12 to 14 inches; he also had to avoid dropping any tools into the satellite. A secondary rig was attached to support his legs and, to keep him from touching any part of the spacecraft, a pole was attached to his legs and guided by another individual. To demonstrate that the technique could be accomplished, the team constructed a mockup of the Titan enclosure and spacecraft solar panels around the despun section of the HS 393 satellite in the high bay area. The setup designed was identical to the configuration at the launch pad and allowed the task team to develop and perfect the techniques and procedures used to remove and replace the unit. The Fire Department officials Dean Anders and Jeff Alvich set up and worked the rigging, with assistance from the nearly 20 task team members representing System Test, Quality Assurance, System Safety, and System Engineering. 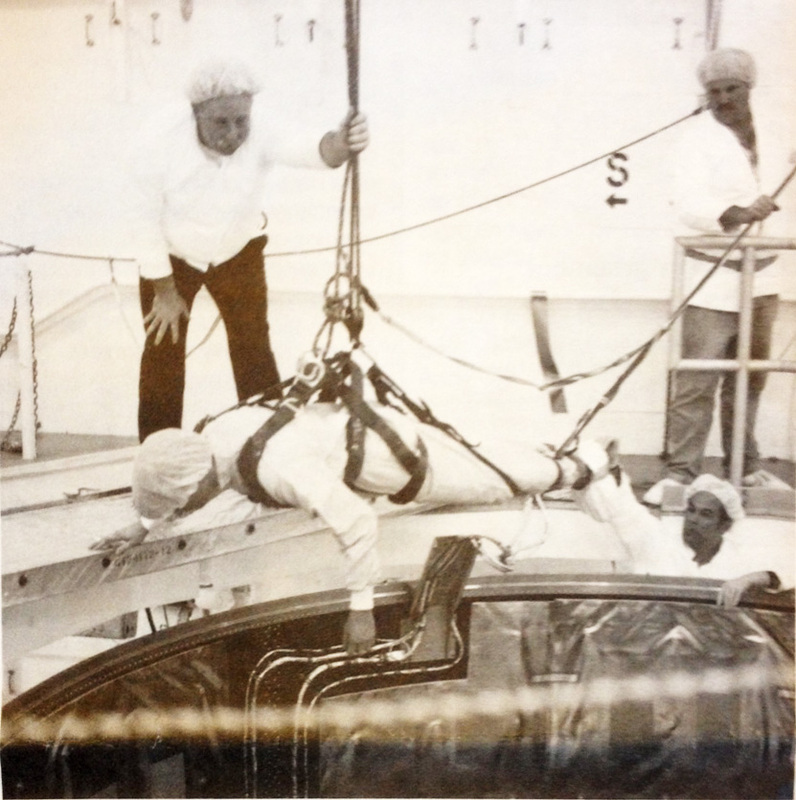 As Corbett was lowered into the spacecraft, he had to curve his body to fit the curvature of the inside edge of the satellite. After Corbett unsealed half of the thermal blankets above the transmitter, he was pulled out, turned around and lowered back in to unseal the other half. A light was lowered down to him also, to keep the tools from dropping, a team member lowered them down to him in a bag; and each time he used a tool, Corbett tied it by a string to his wrist. Once the videotape of the operation was made, SCG officials flew to Florida where they convinced the Air Force that the technique could be accomplished. After the transmitter was removed, it was flown back to SCG and turned over to the Communications Laboratory, where a team of 19 engineers and technicians worked around the clock to repair and test the unit. The transmitter was then returned to Florida and placed back in the spacecraft. The launch went off without a hitch, with all systems working A-OK.
After deployment of the powerful HS 393 satellite from a Titan III rocket, spacecraft controllers at SCG’s Mission Control Center in Building S67 performed a series of mission operations and orbiting sequences. Next they conducted spacecraft checkout under contract to Hughes Communications Inc. (HCI), which procured the satellite from SCG. HCI is a partner in JCSAT with C. Itch & Co. Ltd. and Mitsui & Co. Ltd., two of Japan’s largest trading firms. The spacecraft, placed on station at 153 degrees east longitude, is now set to be delivered to JCSAT after testing of its Ku-band, 32-transponder communications payload. JCSAT 2 joins JCSAT 1, launched last March, in providing Japan with communications services for broadcast and cable television, very small aperture terminal data networks, video teleconferencing, and business television. When JCSAT 1 became operational last May, it inaugurated commercial satellite borne telephone, television, facsimile and high-speed data services for Japanese businesses and consumers.